Denny Schrock was never on to put the cart before the horse. First, at Smithville High School, he became one of the best athletes to ever lace up a pair of sneakers for the Smithies. Then, after lettering four years in track at Bluffton College, Schrock turned his attention to the sidelines. Just as he had done on the court, Schrock became one of the best girls’ basketball and boys’ track coaches in Ohio. “In my 23 years of knowing Denny Schrock, I am most impressed with his caring attitude, his desire to teach and coach , and his enthusiasm”, said Steve Kauffman, Chippewa’s Athletic Director. His interest in sports fueled by his older brothers, Schrock was first a multi-talented athlete who competed at Smithville from 1964-1967. By the time Schrock graduated, he held the school single-game scoring record of 43 points in basketball and had been to the State track meet as a member of the record-setting 880 relay. All told Schrock collected nine varsity letters for SHS, including four in track, three in football, and two in basketball, where he was All-League twice. After graduation from Bluffton, where he earned a Bachelor of Arts Degree, Schrock headed into coaching. 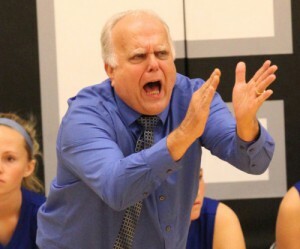 The highlight of his basketball coaching career to date came in 1994, when the Lady Chipps advanced to the Division III State Championship game. They finished as State runner-up. In 1993, Schrock was named the Division III Coach of the Year in Ohio by the Associated Press. In 17 years, as head coach at Chippewa, Schlock’s teams have compiled an astounding won-loss record of 327-62, an .840 winning percentage. Including among those are a current string of 82 straight victories in the Wayne County Athletic League. The Lady Chipps have won the last seven conference championships and 14 in Schrock’s tenure. Twelve times he’s been the League’s Coach of the Year, and three times he’s been the Northeast Ohio Inlands District COY. More importantly he’s coached 11 All-Ohioans, including Charbea Haller, a three-time selection, and Tonya Smoot, a Div. III Player of the Year. But Schrock was equally successful in track, and with the boys. His Chipp teams won a whopping 10 WCAL championships in his 18 years as coach. During that time he had a pair of State Champions in Rick Sales (high hurdles) and Mike Gospodinsky (shot put), as well as four other State qualifiers. Schrock’s 24 League championships as coach in both sports are the most won by any WCAL coach. Schrock and his wife Shannon, live in Wadsworth with their five children.